Flying Fox Studios - STEAM powered studio and store for kids. 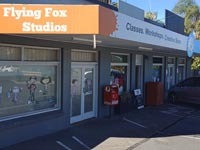 Welcome to the community of Flying Fox Studios, Brisbane's unique creative space for kids, teens, and adults. From our Everton Park studio we run a whole host of STEAM Kids® classes, workshops and activities including Kindermusik, Art Class, Fox Blocks Engineering, WeePlay Wednesday, and our always popular STEAM kids® Holiday Activity program. At Flying Fox Studios, we believe in promoting the enjoyment of a life lived creatively. As educators working with children on a daily basis, we seek to encourage creativity and originality in and through both skill development, and play. From small babies, right up to adults, play is a way that we process our experiences and make sense of the world. Here at Flying Fox Studios we provide opportunities for imaginations, skills and confidence to grow and develop, in a fun and original way. Since opening our Brisbane studio in Everton Park in 2006, we have employed a creative STEAM (science, technology, engineering, arts, and maths) philosophy, which runs through all the classes and workshops we offer. We believe in the combination of creativity, skill development, an enquiring mind, and play. We are a Brisbane owned and operated family small business, with a commitment to quality sustainable and long term classes, curriculum and workshops, and making our local community a better place for all our wonderful students. Over the past 13 years we have seen many thousands of children attend our classes and workshops, and we love adding that creative spark to childhood. Each week over 450 children pass through our doors, participate in our classes and enjoy our family friendly facilities. We pride ourselves on offering a place where children can grow and learn in an environment that encourages creativity, imagination, and divergent thinking. Since late 2007 we have also developed a wonderful creative STEAM kidsTM focused children's shop on site, stocked full of hand picked resources chosen to support our love of creative play and learning. As a social enterprise business model, all proceeds from our small store are put back into our wonderful programs we offer our local community, and also directly fund our weekly WeePlay Wednesday community play session. "My children have been attending classes at Flying Fox Studios since the doors were first opened, in late 2006. It has been wonderful to watch this family business grow over that time. My children have benefited from the countless classes and workshops they have attended over the years, and are now growing into creative young adults during their teenage years"
The Flying Fox Studios Community. At Flying Fox Studios we love to see community between our families, and have designed our facilities with this in mind. We have parents who have attended classes together since their children were babies, and now they are still together in our high school age classes! Families, Grandparents and friends enjoy catching up over coffee in our parents lounge room, or letting the kids have a play after class in our backyard. We provide free tea, coffee and biscuits for all our families, as well as a fun and relaxed environment for kids to enjoy before or after class. Many local families have enjoy our WeePlay Wednesday social play session that is run during our term time. These are just some of the extra things that makes Flying Fox Studios unique to brisbane, and a fabulous place to visit. Welcome to Flying Fox Studios, a creative studio and shop for all ages and stages. Here we offer a haven for all things creative, educational, artistic, musical, and most of all.. fun! 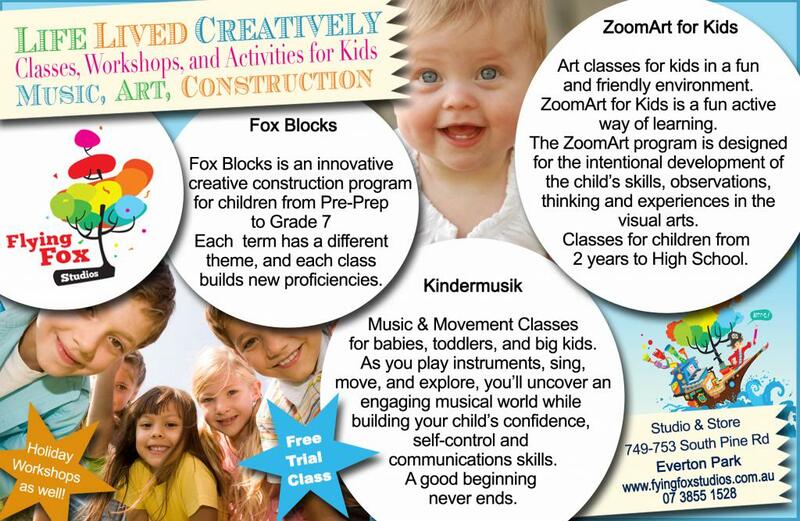 We offer Kindermusik, ZoomArt for Kids, Fox Blocks STEM, and STEAM Kids Holiday Workshops as well as a whole host of other off campus workshops, festival events, and pop up classes. STEAMkids is our little on site shop, as well as online, and is jam packed full of top quality resources, toys, gifts and treasures for all ages.